Ralph Lauren | 38'100 € Tax inc.
To celebrate the 50th anniversary of the Ralph Lauren fashion and watches brand based in New York, Ralph Lauren watches is broadening its collection with the new American Western watch. This watch collection moves West of New York and presents a real, genuine American Western style. 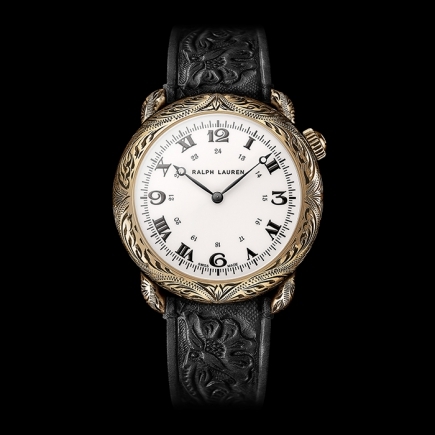 All the American Western watches (both wrist watches and pocket watches) of this new Ralph Lauren collection were produced with antiqued silver or rose gold and all feature a high level movement and unique hand engraving on the case (and case cover for the pocket watch). Cushion-shaped watches are rare models that only a few brands continue to offer. These cushion watches have an undeniable vintage feeling, which is exactly what Ralph Lauren watches is seeking to offer with its American Western collection. Cushion-shaped watches are even more rare when they are proposed in sterling silver, a material more often found on the case of ladies watches. Watch models produced using the silver material (whether antiqued or not) emit a unique white reflection, which confers to the watch a unique vintage touch. The cushion-shaped wrist watch of the new American Western collection by Ralph Lauren is a strong statement by the fashion and luxury watch brand based in New York. Indeed, one can sense the profound and honest approach adopted by Mr. Ralph Lauren in the creation of this watch collection. 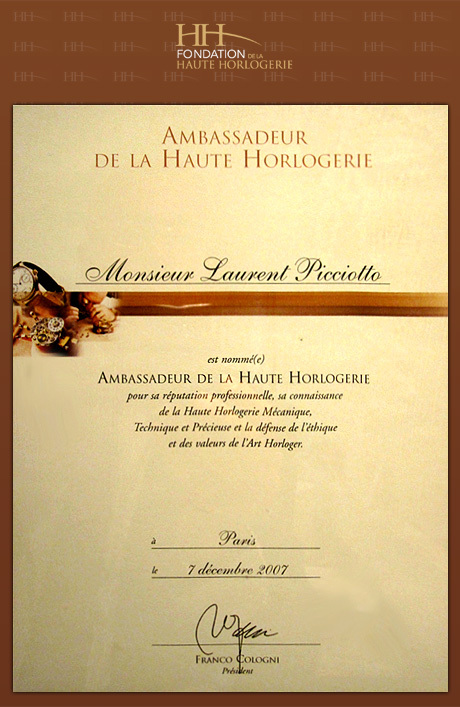 No compromises were made, be it on the movement (made for Ralph Lauren by Piaget), the craftsmanship put into the creation of the antiqued silver or gold case, the special treatment of the leather strap and the typical Ralph Lauren style of the off-white lacquered dials (combining Roman and Arabic numeral hour-markers). This very balanced blend of modern and vintage elements could be called the neo-western style, perfectly embodied by Mr. Ralph Lauren himself. As Mr. Ralph Lauren says himself, it contains a “rugged elegance and authenticity that people relate to”. The cushion-shaped American Western watch by Ralph Lauren is a 42 mm watch, available in two versions: antiqued sterling silver or rose gold. Both models are highly appealing precisely because they are unusual. They remind us in a way of the style provided by antiqued pocket watches. Nowadays, pocket watches are only rarely found in the watch collections proposed by the main brands. So the cushion-shaped watch by Ralph Lauren has the advantage of giving this unique sense and this spirit of a pocket watch, but with all the advantages of being able to wear it on your wrist. The cushion-shaped watch produced by the Ralph Lauren fashion and watch company is definitely American in style and in spirit. Close your eyes and you will see it on the wrist of a modern cowboy, with a pair of leather boots and a big leather belt around his waist. 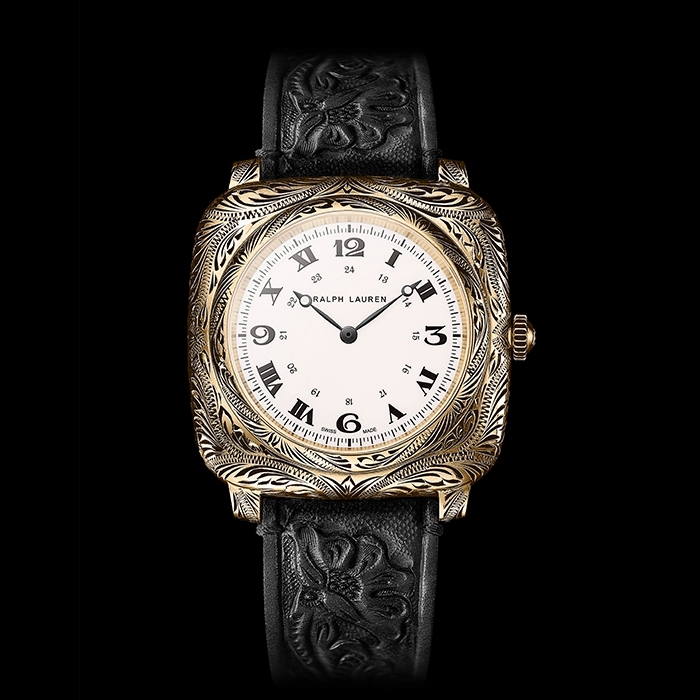 Yet as rugged and antiqued as it can feel, the watch displays the most amazing hand engraving on its case. Pure American Western luxury. 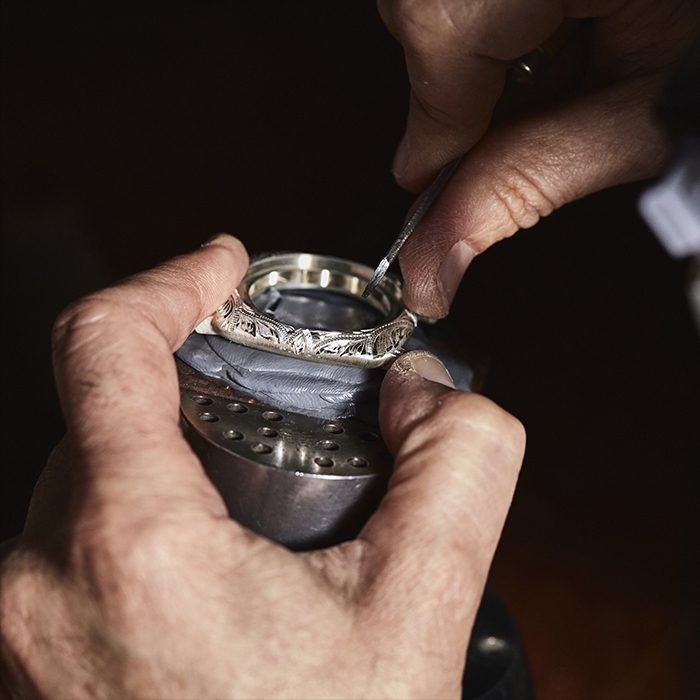 The hand engraving is about just as impressive as the automatic Swiss movement that brings the watch to life. The movement holds an approximately 40-hour power reserve. An additional vintage touch to the American Western cushion watch by Ralph Lauren comes from the off-white lacquered dial. 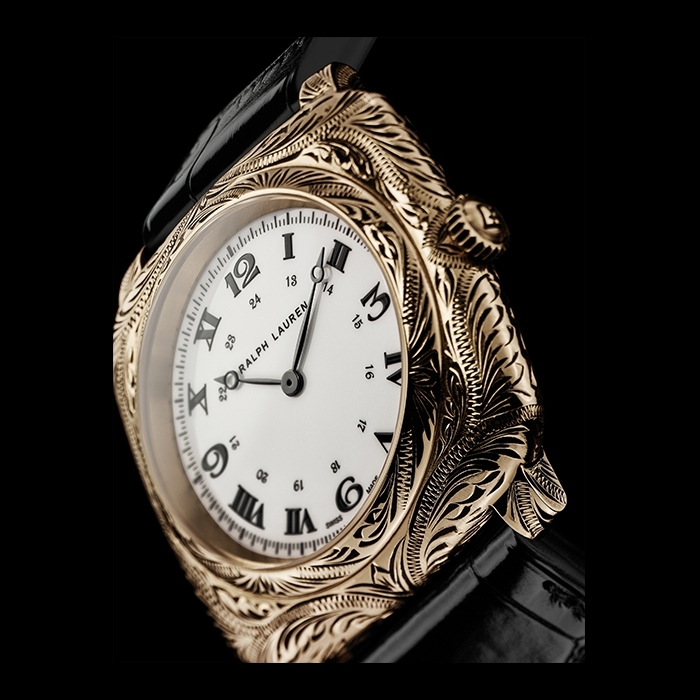 The audacious design style so typical of the Ralph Lauren company and consisting in combining Arabic and Roman numerals contrasts with the resolutely classic touch provided by the Breguet style watch hands. 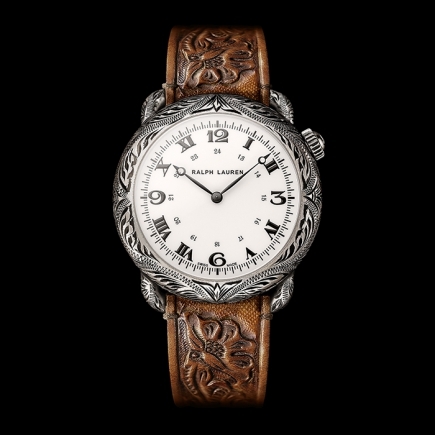 The Ralph Lauren American Western cushion watch (be it the antiqued silver model or the rose gold model) displays a rugged elegance and authenticity that people want to relate to. This comes greatly from the hand engraving of the watch case, from the Texas hand-tooled leather, then burnished in Italy, and from the vintage colour and style of the dial. 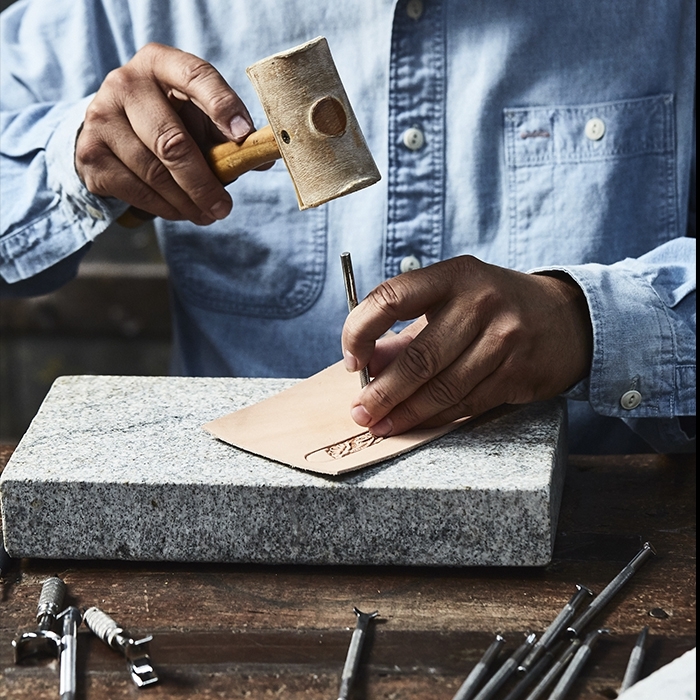 The Ralph Lauren watch brand, based in New York, has collaborated with the best artisans worldwide to create both a sensibility and honesty that gives the American Western cushion watch an enduring appeal.